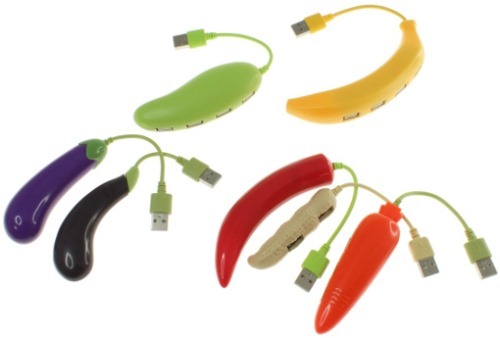 Check out these fruit and vegetables USB 2.0 hubs. They come from Dospara and each one has four USB 2.0 ports. You have your pick between; mango, banana, peanut, a large or small eggplant, pepper or a carrot. Each one supports either Windows or Mac operating systems and is also backed by a two week warranty. For 499 Yen (or $5 each) you can have one or all to add a little pzazz to your work space. Maybe you could put them next to your grapes. The bell has now been merged with your computer via USB. Instead of computer generated dings to tell you when you have new email, this bell will ding to let you know. This would probably get old after a while, but at least you will know when you have mail. 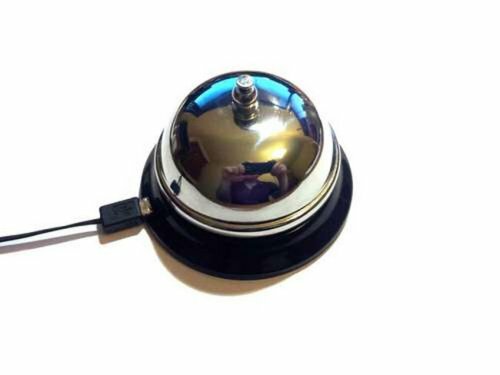 The USB bell uses an electromagnet to activate the bells sound. It’s easy to build, you just need a few parts and then you’ll have to do some soldering. 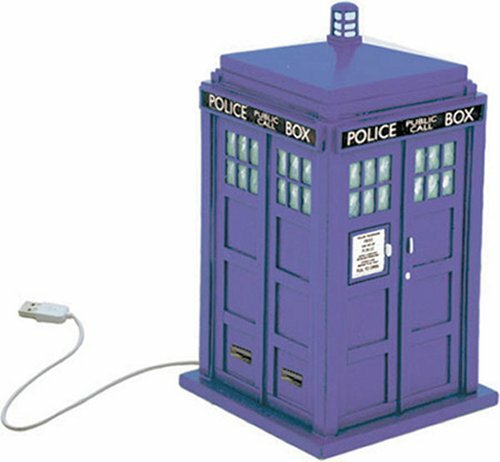 Doctor Who fans will love this USB hub. It features a flashing lantern on top and Tardis sound effects. You may not find the Doctor and his companion inside, but it will prove very useful sitting on your desk. It will cost you about £23. Hopefully it won’t suddenly de-materialize and go on it’s own adventure, but if it does I’m sure it will be back soon. After all, Earth seems to be home base for the Doctor these days. Here’s a mouse that is not your average boring variety. 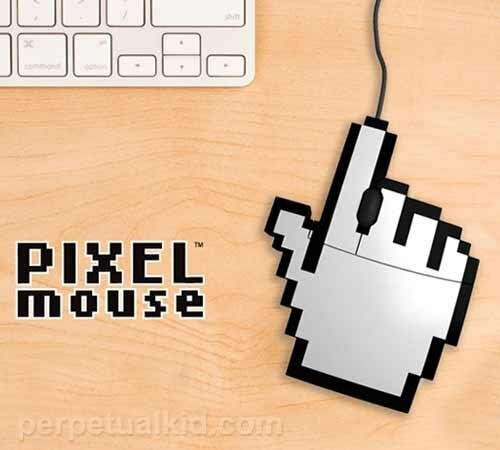 It is made to look like a pixelized image of a right hand mouse pointer that you’ve seen many times on the monitor. The scroll wheel that is located between the index finger and middle finger. It works like any other mouse, just looks cooler on your desk. If you like it, this one will cost you $19.99. Though you might get sick of it pointing all of the time. We have so many gadgets and so few outlets that directly accommodate them. Thankfully more of these USb wall outlets are showing up to make our lives easier. 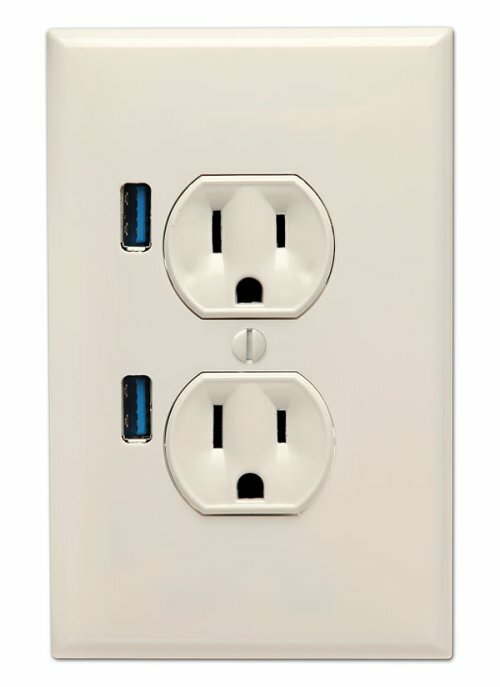 The U-Socket USB wallplug is a fully working outlet with two USB ports added. With this outlet you could just plug your USB device right into the wall for a quick charge. Obviously you or an electrician have to install it, but once that’s done, viola, easy charging! 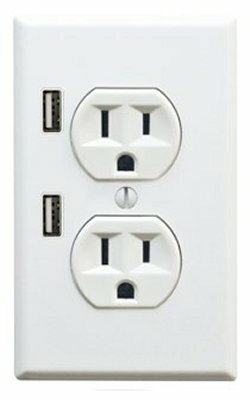 The U-Socket is $24.99 at ThinkGeek. Looking for something unique in an mp3 player? This one is the bomb. Literally. The USB Bombshell MP3 Player is shaped like a bundle of dynamite sticks. The portable speaker also doubles as a MP3 player. Features include: Getting you detained at the airport, a USB port, SD card Slot and it will connect to all iPods, MP3, CD players, notebook, mobile phones and other digital products with the 3.5mm stereo audio connector. The USB Bombshell MP3 player retails for $43. Time to blow up your tunes. Looking for an alternative to your air conditioner this summer? One that you don’t have to lift a finger to control? Well, this USB fan can help. The monoDO from Synnex is a USB powered Fan that comes with a voice control function allowing you to turn it on or off without even touching it. 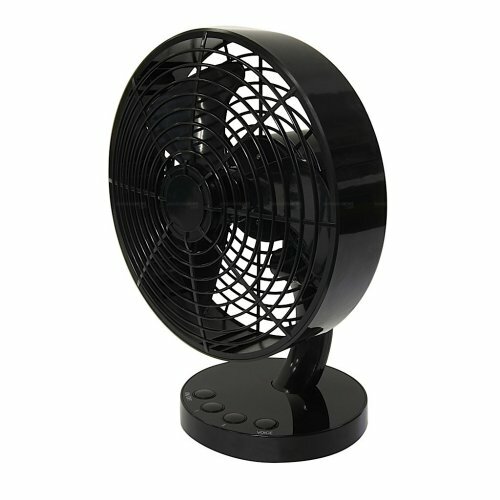 Synnex’s monoDO Voice Controlled USB Fan is available in black and white for around 2,980 Yen. Keep cool my friends, without having to break a sweat by getting up. It may not look like much, but this is the first USB 3.0 video card. And don’t worry, you don’t have to sacrifice image quality and frame rates with this device because USB 3.0 has enough bandwidth for even multiple HD monitors. Awesome. 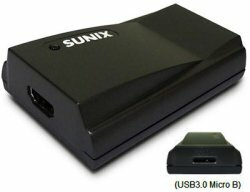 This USB 3.0 video card from Sunix has a GPU either from in-house or SMSC. The adapter draws just 400mA current, helping with backwards compatibility. That means that the dongle will work when plugged into a USB 2.0 port. The max resolution the adapter can handle is 2048×1152 and the HDMI 1.2 connection. Here’s the latest in crazy cat gadgets and I’m not talking Hello Kitty. 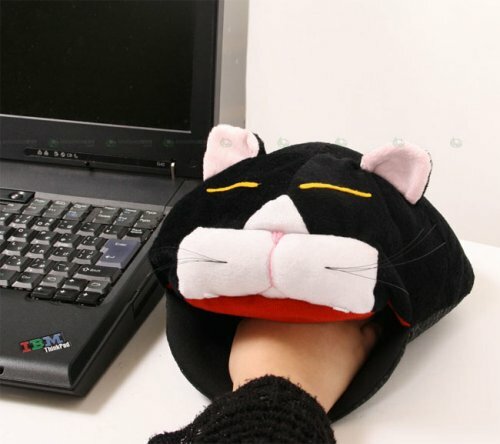 It’s a mouse pad shaped like a cat head with a USB heater inside. You know, in case your hand gets cold and you would like to stick it in a cat’s mouth. Weird. The cat pad is 234 mm x 260 mm x 110 mm (9.21 in x 10.24 in x 4.33 in) and weighs 95 g (3.35 oz). No word on price but I can think of much better uses for your money. What if your poor cat sees this. He will think that he’s gonna get a fist in his mouth too. It’s just not right. 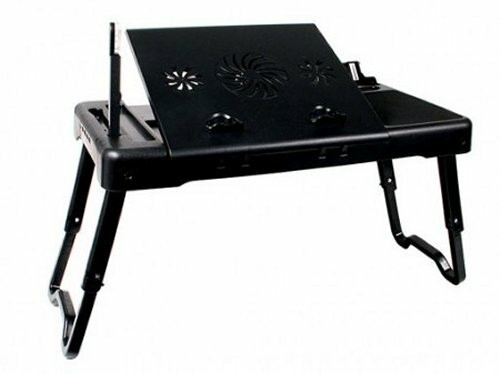 Thanko has introduced an ugly looking notebook desk that makes up for it’s lack of style by coming equipped with a USB hub, a laptop cooling fan and some shiny LED lights. 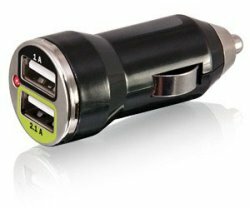 The built-in USB hub has 4 USB 2.0 ports, while the LED lights are powered by four batteries or USB bus power. Folks in Japan, who don’t mind a bit of ugly in their gadgets can buy the new Thanko notebook desk for about $50. Thanko has released a tiny HD video camera in the shape of a USB stick. The Video Pen HD will shoot 720p, 30FPS videos from the pocket of your shirt. It stores the recordings onto microSDHC memory cards up to 32GB in capacity, and has a quarter-inch, five-megapixel CMOS sensor. The video clips are 30 minutes in total, and the built-in battery will charge in three hours. Photos shoot at the full five-megapixel (3200×2400) size. 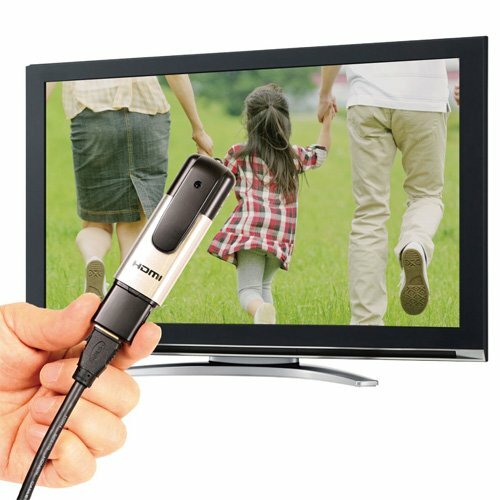 An HDMI and USB cable are included and the device can also serve as a microSDHC card reader. If you have a flash drive that isn’t encrypted, the Hiddn Crypto USB Adapter is an easy way to encrypt flash drives, external drives, and other USB-connected storage media. The device offers secure and easy to use protection for all your externally stored data. It does this using two-factor authentication in the form of a smartcard storing all encryption keys and a PIN-code. 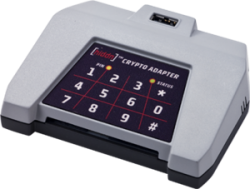 The Hiddn Crypto USB Adapter uses FIPS 140-2 Level 3 and Common Criteria EAL4+ certified Hiddn Crypto Module. Nothing on pricing or availability yet though. FastMac’s wall socket that offers a pair of standard 110V power outlets along with two USB ports is finally shipping. If you ordered early enough, chances are you’ve already gotten a confirmation email and it is on it’s way. You still have to be patient, as the site promises a three to four week delivery time for orders placed today, but at least things are moving nicely. It won’t be long before you are using standard plugs and USB side by side. The NZXT Bunker will help prevent expensive USB equipment from being stolen. The Bunker provides four USN ports beneath a locking mesh lid, allowing you to lock your USB devices down to prevent them from being unplugged. The device will fit conveniently into a 5.25-inch drive bay and the NZXT Bunker USB Lock System goes the extra mile, as it also supports a sophisticated 20 keylock system that prevents users with the same device from unlocking the lock.